The wizards of Langley : inside the CIA's Directorate of Science and Technology · One Book. One Author. One Hour. Notes from front endpapers: "Helms: establish (1963) offensive capability to use biological and chemical warfare, p. 50. - A12/OXCART, U-2, SR71; Corona satellite photographer; terrorism, p. 289. - NIMA: created 1996; mapping function; 12 different imagery transmission systems during Gulf War, p. 273. - 9,000 people - largest agency outside CIA/NSA." -- Notes from back endpapers: "1984: Kabul, listening, p. 258. - Pakistan - 1995, March - p. 259. - Gary Durrell - 16 bullets - tied to 1993 World Trade Bombing. - Psychics - Gadhafi. - Tunnels in North Korea. - Stealth satellite program - Misty - earlier KH-11, 1984. - Why runs CIA/NSA? - How much do they cost? - How many work there? - Where are they located? - What are their missions? - How much of their activity is devoted to terrorism? - 1960: Assassinations: Lumumba (Belgians did it), Castro." -- Annotations by Brian Lamb in the margins and underlining of pertinent phrases throughout the book. 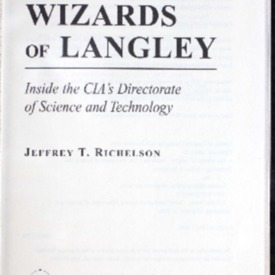 Richelson, Jeffrey, “The wizards of Langley : inside the CIA's Directorate of Science and Technology,” One Book. One Author. One Hour., accessed April 19, 2019, http://booknotes.gmu.edu/items/show/535. In 1956, the CIA dramatically breached the Iron Curtain when its U-2 began overflying Soviet territory to photograph that nation's military installations. Four years later, the Soviets would shoot down pilot Francis Gary Powers and his U-2, thereby ceasing these missions. Within months, however, the CIA had another, and better, technical program in operation - the CORONA satellite. Throughout the Cold War and beyond, the CIA's scientific wizards would continue to devise high-tech ways to collect and analyze information about potential adversaries. Their mission was of such importance that a new branch of the CIA was created - the Directorate of Science and Technology. "In this first full-length study of the CIA's Directorate of Science and Technology, author Jeffrey T. Richelson introduces us to key personalities who helped shape the directorate: Edwin Land of Polaroid, Albert Wheelon, Carl Duckett, and others who operated secretly within the directorate such as Antonio Mendez, whose "technical service" skills helped six Americans escape Iran after the seizure of the U.S. Embassy in 1979"--Jacket. "United States. Central Intelligence Agency. Directorate of Science and Technology--History."